Are you a caffeine fiend attempting to plan a wedding? Then you’re going to love our brew-tiful bridal coffee mugs! Your caffeine intake has most likely doubled if not tripled since your engagement and the thought of not having your delicious cop up joe every day to get your through all the details sounds unbearable. From that first brew in the morning to your travel mug as you hit all your appointments, there’s nothing you love more than coffee. Well, with the exception of your future hubby. Why not combine the two? Engaged? Just married? Easily customize a mug for every step of the wedding process! With our amazing design center you can create your own, one a kind bridal coffee mug! If you don’t like the style or color of any design already in our gallery you can simply customize it to your liking. Our design center makes it effortlessly easy to swap out the product, color, art, font, and text. But that’s not what makes Bridal Party Tees the best online provider for custom apparel. Our hard to beat no minimums and incredible group discount allows our bride-to-be’s to create and ordered that one special custom mug with your future last name or dozens of mugs as party favors for all of their guests! Are you looking for a unique and fun way to pop the question to your future bridesmaids? Look no further because Bridal Party Tees has got you covered. 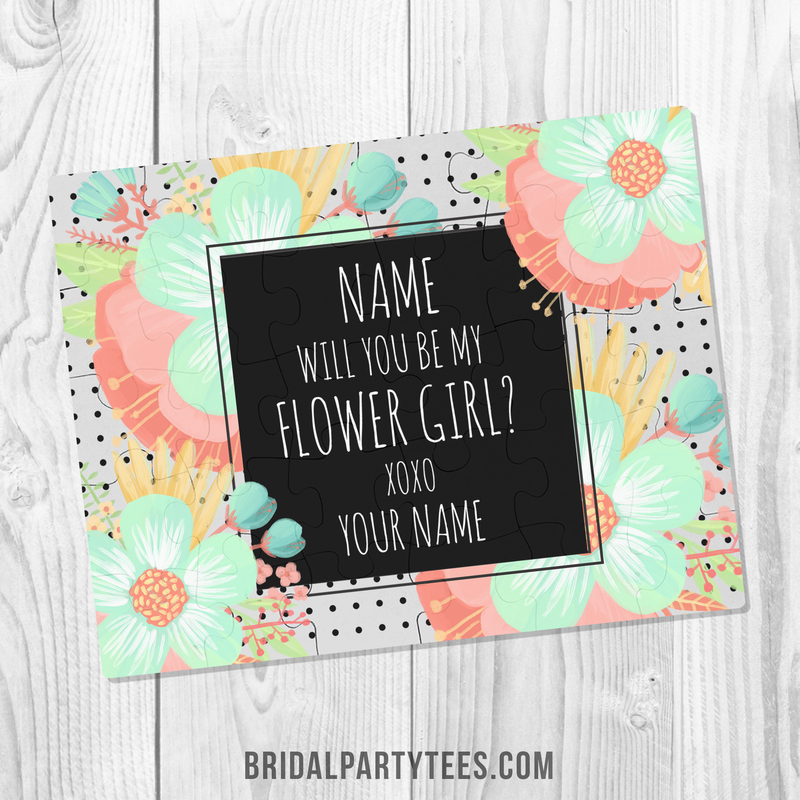 Surprise your maids with a custom jigsaw puzzle with their name and picture on it! 1. Choose your favorite design in our gallery or start with a blank puzzle. These step-by-step instructions are simple to follow, but if you have any questions feel free to contact our Customer Service team. Imagine your bestie piecing together a photo of the two of you asking her to be your maid of honor. A memory you’ll both will never forget! Get ready on your big day with a custom bridal robe. Use coupon code below to save! Use coupon code S9BPT7 at checkout and get 5% off orders of $25.00 or more! Offer expires 9/30/2017 at 11:59PM EST.